If you are a regular searcher for exotic parts among the virtual pages of semiconductor supplies catalogs, you will have probably noticed that for a given function it is most often the part bearing the Analog Devices logo that is the most interesting. It may have more functionality, perhaps it will be of a higher specification, and it will certainly have a much higher price. [Zeptobars] has decapped and analyzed an AD chip that holds all three of those honors, the AD9361 SDR transceiver. It’s placed under a slightly inflammatory title, “when microchips are more profitable than drugs“, but does make a good job of answering why a semiconductor device at the very cutting edge of what is possible at the time of release can be so expensive. The AD9361 is an all-in-one SDR transceiver with an astonishing bandwidth, and as such was a particularly special device when it reached the market in 2013. We see some particularly fine examples of on-chip inductors and PLL circuitry that must have consumed a significant design effort to preserve both bandwidth and noise characteristics. This is an item of physical beauty at a microscopic scale as well as one of technical achievement. The financial analysis puts Analog Devices’s gross profit at about $103 of the $275 retail purchase price of an AD9361. The biggest slice at $105 goes to the distributor, and surprisingly the R&D and manufacturing costs are not as large as you might expect. How accurate these figures are is anybody’s guess, but they are derived from an R&D figure in the published financial report, so there is some credence to be given to them. We’ve featured [Zeptobar’s] work before more than once. A look at fake Nordic Semi parts for example or a Soviet i8080 clone have received their treatment. Always a source to watch out for! Analog Devices and Linear Technology have announced today they will combine forces to create a semiconductor company worth $30 Billion. This news follows the very recent acquisition of ARM Holdings by Japan’s SoftBank, and the later mergers, purchases or acquisitions of On and Fairchild, Avago and Broadcom, NXP and Freescale, and Microchip and Atmel, Intel and Altera, and a few more we’re forgetting at the moment. Both Analog and Linear address similar markets; Analog Devices is best known for amps, interface, and power management ICs. Linear, likewise, isn’t known for ‘fun’ devices, but without their products the ‘fun’ components wouldn’t work. Because the product lines are so complimentary, the resulting company will stand to save $150 Million annually after the deal closes. Analog and Linear are only the latest in a long line of semiconductor mergers and acquisitions, but it will certainly not be the last. The entire industry is consolidating, and the only way to grow is by teaming up with other companies. This leads the question if there will eventually only be one gigantic semiconductor company in the future. You’ll get different answers to that question from different people. Hughes, Fairchild, Convair, Douglas, McDonnell Douglas, North American, Grumman, Northrop, Northrop Grumman, Bell, Cessna, Schweizer and Sikorsky would say yes. Lockheed Martin and Boeing would say no. It’s the same thing. One of the keys to nuclear fission is sustaining a chain reaction. A slow chain reaction can provide clean power for a city, and a fast one can be used to create a weapon that will obliterate a city. These days, kids can learn about Uranium and Plutonium in high school. But just a few generations ago, the idea of splitting the atom was just a lofty goal for the brightest physicists and mathematicians who gathered at Los Alamos National Laboratory under the Manhattan Project. Decoding the mysteries of nuclear fission required a great deal of experimentation and calculations. One bright physicist in particular made great strides on both fronts. That man was [Enrico Fermi], one of the fathers of the atomic bomb. Perhaps his greatest contribution to moving the research beyond the Manhattan Project was creating a handheld analog computer to do the math for him. This computational marvel is known as the FERMIAC. 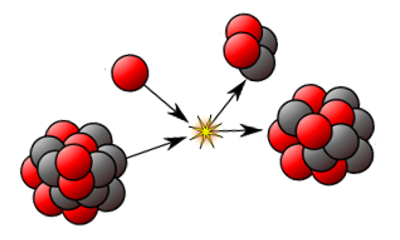 Nuclear fission occurs when a nucleus is split into fragments, a process that unleashes a great deal of energy. As a handful of neutrons travel through a reactor pile or other fissionable material, a couple of outcomes are possible. Any one neutron collision might result in fission. This means there will be some number of new neutrons whose paths must be tracked. If fission does not occur, the neutrons may simply scatter about upon collision, which changes their speed and trajectory. Some of the neutrons might be absorbed by the material, and others will simply escape it. All of these possibilities depend on the makeup of the material being bombarded and the speed of the neutron. Every event that happens to a neutron comprises its genealogical history. If this history is recorded and analyzed, a statistical picture starts to emerge that provides an accurate depiction of the fissility of a given material. [Fermi]’s computer facilitated the creation of such a picture by performing mathematical grunt work of testing different materials. It identified which materials were most likely to sustain a reaction. Before he left Italy and the looming threat of fascism, [Fermi] led a group of young scientists in Rome called the Via Panisperna boys. This group, which included future Los Alamos physicist [Emilio Segrè], ran many experiments in neutron transport. Their research proved that slow neutrons are much better candidates for fission than fast neutrons. During these experiments, [Fermi] ran through the periodic table, determined to artificially irradiate every element until he got lucky. He never published anything regarding his methods for calculating the outcomes of neutron collisions. But when he got to Los Alamos, [Fermi] found that [Stanislaw Ulam] had also concluded that the same type of repeated random sampling was the key to building an atomic weapon. The Monte Carlo Method: Shall We Play a Game? [Ulam], a Polish-born mathematician who came to the US in 1935, developed his opinion about random sampling due to an illness. While recuperating from encephalitis he played game after game of solitaire. One day, he wondered at the probability of winning any one hand as laid out and how best to calculate this probability. He believed that if he ran through enough games and kept track of the wins, the data would form a suitable and representative sample for modeling his chances of winning. Almost immediately, [Ulam] began to mentally apply this method to problems in physics, and proposed his ideas (PDF) to physicist and fellow mathematician [John von Neumann]. This top-secret method needed a code name. Another Los Alamos player, [Nick Metropolis] suggested ‘Monte Carlo’ in a nod to games of chance. He knew that [Ulam] had an uncle with a propensity for gambling who would often borrow money from relatives, saying that he just had to go to Monte Carlo. The game was on. Determination of the elements most suitable for fission required a lot of calculations. Fission itself had already been achieved before the start of the Manhattan Project. But the goal at Los Alamos was a controlled, high-energy type of fission suitable for weaponization. The math of fission is complicated largely because of the sheer number of neutrons that must be tracked in order to determine the likelihood and speed of a chain reaction. There are so many variables involved that the task is monumental for a human mathematician. After [Ulam] and [von Neumann] had verified the legitimacy of the Monte Carlo method with regard to the creation of nuclear weaponry, they decided that these types of calculations would be a great job for ENIAC — a very early general purpose computer. This was a more intensive task than the one it was made to do: compute artillery firing tables all day and night. One problem was that the huge, lumbering machine was scheduled to be moved from Philadelphia to the Ballistics Research Lab in Maryland, which meant a long period of downtime. While the boys at Los Alamos waited for ENIAC to be operational again, [Enrico Fermi] developed the idea forego ENIAC and create a small device that could run Monte Carlo simulations instead. He enlisted his colleague [Percy King] to build the machine. Their creation was built from joint Army-Navy cast off components, and in a nod to that great computer he dubbed it FERMIAC. FERMIAC was created to alleviate the necessity of tedious calculations required by the study of neutron transport. This is something of an end-run around brute force. It’s made mostly of brass and resembles a trolley car. In order to use it, several adjustable drums are set using pseudorandom numbers. One of these numbers represents the material being traversed. A random choice is made between fast and slow neutrons. A second digit is chosen to represent the direction of neutron travel, and a third number indicates the distance traveled to the next collision. Once these settings are dialed in, the device is physically driven across a 2-D scale drawing of the nuclear reactor or materials being tested. 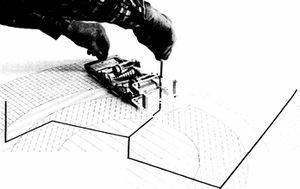 As it goes along, it plots the paths of neutrons through various materials by marking a line on the drawing. Whenever a material boundary is crossed, the appropriate drum is adjusted to represent a new pseudorandom digit. FERMIAC was only used for about two years before it was completely supplanted by ENIAC. But it was an excellent stopgap that allowed the Manhattan Project to not only continue unabated, but with rapid progress. FERMIAC is currently on display at the Bradbury Science Museum in Los Alamos, New Mexico alongside replicas of Fat Man and Little Boy, the weapons it helped bring to fruition. [Fermi]’s legacy is cemented as one of the fathers of the atomic bomb. But creating FERMIAC cements his legacy as a hacker, too. After Los Alamos, [Stanislaw Ulam] would continue to make history in the field of nuclear physics. [Enrico Fermi] was opposed to participating in the creation of the exponentially more powerful hydrogen bomb, but [Ulam] accepted the challenge. He proved that Manhattan Project leader [Edward Teller]’s original design was unfeasible. The two men worked together and by 1951 had designed the Teller-Ulam method. This design became the basis for modern thermonuclear weaponry. Today, the Monte Carlo method is used across many fields to describe systems through randomness and statistics. Many applications for this type of statistical modeling present themselves in fields where probabilities are concerned, like finance, risk assessment, and modeling the universe. Wherever the calculation of all possibilities isn’t feasible, the Monte Carlo method can usually be found. UPDATE: Commentor [lwatchdr] pointed out that the use of the FERMIAC began after the Manhattan Project had officially ended in 1946. Although many of the same people were involved, this analog computer wasn’t put into use until about a year later.